It is the way of a new wife to be…how shall we say this…..hmmm...new and inexperienced at EVERYTHING. Don’t get carried away, I’m simply referring to the plight of cold hot dogs. Cold hot dogs for months and months. Cold hot dogs unbeknownst to a new, excited, and inexperienced wife. To tell the story correctly, we must back up 366 days. Maybe more. If you look in the little blue trailer, you will see a young woman. We will refer to her as Happy Wife. Down the hall, and looking into the second window, you will see Loving Husband. Do these characters sound familiar to you? You’ve heard of them before in this unfortunately true story. Happy Wife and Loving Husband were enjoying the first few blissful months of marriage. Finding new routines, being overwhelmed in the grocery store, joining accounts, ordering checks, obtaining the marriage certificate, changing a social security number, painting a new home, moving everything, organizing everything, combining everything into one life. Blissful?! HA. More like overwhelming. But despite the tangled mass of things to do and set right, there was bliss and inexperience and a lot of happiness. I mean, a lot of it. As we enter the first blue home of Happy Wife and Loving Husband, we see the wife preparing a lunch for her husband to take to work. She always felt as though preparing him a hot dog for lunch was a small act of love. Her husband really liked hot dogs, and wife took extra care in making sure he had all the condiments necessary to eat a delicious hot dog after a long morning of construction work. She loved making him lunch and scorned all the make- a-sandwich bladdy blah. She was loving him by packing this hot dog, and of course, all the other things necessary for a good lunch. It is the way of Loving Husband to endure the good intentions of his new bride. As Happy Wife kissed Loving Husband goodbye, she was pleased to have done the loving thing in the extra care of a hot dog feast. As he drives away, Happy Wife thinks to herself “Take that you women with the make-a -sandwich phobia”. She was so happy to make her husband a lunch. He worked so hard! Surely, Loving Husband would enjoy his lunch! Happy Wife went to accomplish all the other tasks the day required of her. She just loved being a wife! When her husband arrived home, she eagerly asked if he enjoyed his lunch. He said yes, but kept certain thoughts to himself. “I don’t think she knows I ate it cold. I don’t think she knows I don’t have a way to heat it up. It probably slipped her mind. I won’t say anything.” And so he didn’t. On his next work day, he gets a sandwich (because Happy Wife even with all her shortcomings did some things quite well) and thought that a bit of variation would be nice! This man of hers worked very hard, you see. Loving Husband was relieved to eat a sandwich instead of a cold hot dog. Perhaps the cold hot dogs were behind him. But they’d only just begun. Over and over and over again, he would open his lunch to find a cold hot dog packed for him in the name of love…but it was still very, very cold. Loving Husband kept this to himself, while oblivious Happy Wife continued to make various lunches with care, the hot dog feast a regular in the lunch rotation. Until one day, as Happy Wife was throwing away the discarded lunch plastic baggies and cleaning out the containers she realized something rather huge. A light bulb moment, if you please. “Wait. He doesn’t have a way to heat these hot dogs up! How long I have been packing cold hot dogs for this poor man!” Happy Wife is no longer oblivious and she mentions her mistake to her husband who is– by now–very well acquainted with the weeks and months of this well-meant cold hot dog fiasco. There were no hard feelings, though Happy Wife did not understand how it could have taken her the better part of a year to figure out her folly. But love endures! Who knew cold hot dogs would be the one major mistake of the first year of marriage. 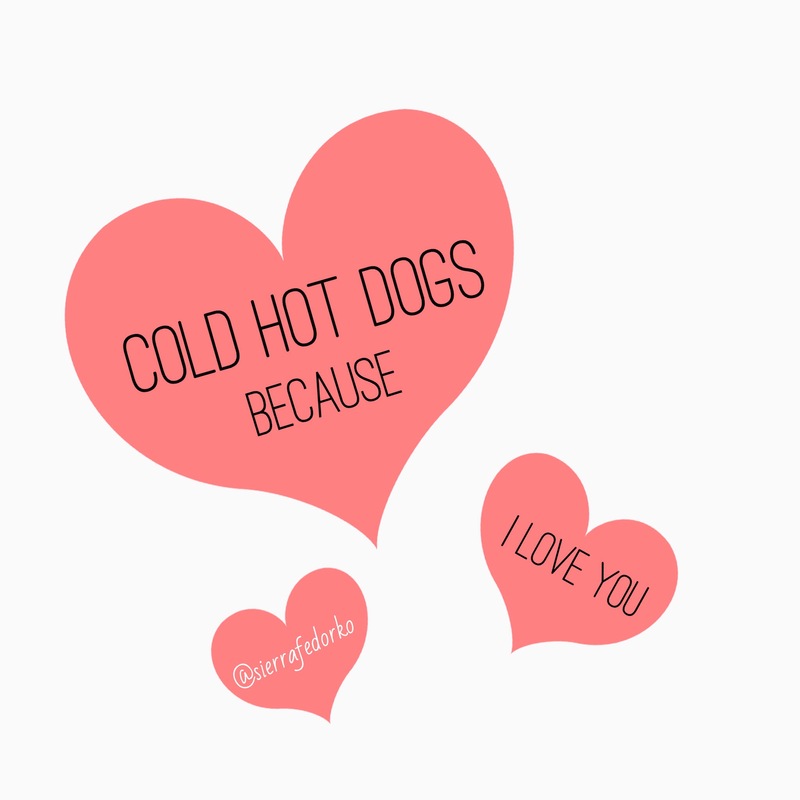 Cold hot dogs, in the name of love are the best kind of hot dogs….if only they weren’t so cold. There are big things to learn in this story. For one, if you’re a loving husband, tell your wife about the cold hot dogs! So many miserable lunches could be avoided. Yes, yes I know you love her and you don’t want to point out her mistakes, but she may not realize her folly until months later! Imagine the horror! For two, if you’re a happy wife, make the stupid sandwich! Just do it. And then never ever pack a hot dog unless you know there is a way for it be to be served warm. At the end of the day, the Happy Wife served cold hot dogs, because she loved her husband very much and the Loving Husband ate the cold hot dogs (for months) because he loved his wife too much to make her feel bad. So if you’re going to do anything with cold hot dogs, make sure it’s done in the name of love! But remember that love cannot live on cold hot dogs for long. This gave me a good laugh! Reminded me of myself and how excited I have been to do something for Caleb. Then realize the flaws long after. I absolutely loved this! Your writing is so genuine, open, sweet…and funny! Isn’t being married to a wonderful husband the BEST?!? Thank you for sharing this. It made me smile. 🙂 Hope you’re all doing well! It makes me very glad that you enjoyed this! I LOVE being married to Ben. I learn big and small things all the time! 🙂 Thanks for your encouragement.